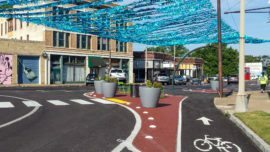 Alta’s Placemaking team worked with LRK, the Michigan Baseball Foundation, and the community to update and refresh the Main Street streetscape. 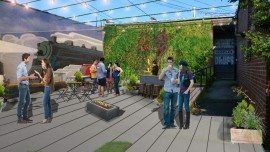 The goal of this refresh is to create a better connection between downtown, the ballpark, and the proposed Farmer’s Market. 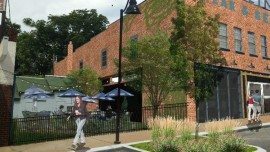 While the North portion of Ashman will continue to have a retail focus with parking on both sides of the street. A more pedestrian friendly environment will be created by using green infrastructure, such as biofiltration swales and urban rain gardens, to celebrate the connection between stormwater and the river. Interpretive signage is included for educating the public on the importance of cleaning stormwater prior to entering natural waterways. Raised intersections at Gordon, Ashman, and McDonald are recommended using a paving pattern that celebrates the theme of the gateways. The sidewalk treatments throughout the corridor include replacement of raised planters with specialty pavements, allowing for outdoor dining, public art, and seating. 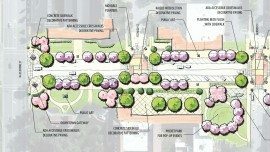 The main pedestrian travel way includes new canopy street trees, perennials and annuals, an eight-foot-wide scored concrete walk, ornamental street lighting, and complimentary site furnishings.